My assertion to you is this: People who talk in this way and use this kind of language are simply NOT walking according to the Spirit and are walking according to the flesh instead. Now, I’m NOT assuming that open air preachers who do this have ALWAYS walked according to the flesh. There’s a good chance that they simply went off in that direction at some point in time. What brought them to this point? I don’t know, specifically. I’m sure that each situation is different. It could be that such people are hanging around such vile sinners, that they are preaching to, that it has made an impact on them in a negative way. It could be that such people are preaching so much and so often, that they are neglecting times of private prayer and Bible study – alone time with the Lord, which would severely hinder them from saying such things. It could be that they are not trusting in the Word of God ALONE to draw a crowd of people to hear the Gospel and instead engage in “crude language” and “vulgar/obscene language” to gather the attention of passerby’s. Or it could be that they are being influenced by other open air preachers who are saying these things. Either way, just like Jesus said, you will know them by their fruit (Matthew 12:33). In this passage of 5 Bible verses, Jesus makes it clear that you will know someone by their fruit. He goes on to say that you will know someone’s “heart” (whether they are a “good tree” or a “bad tree”) by what comes out of their mouth. If evil things come out of someone’s mouth, then that means that they have an “evil heart”. If good things come out of someone’s mouth, then that means that they have a “good heart”. Jesus even says that our words will justify us or condemn us and that even our “idle words” will be brought into judgment! Why? Because our words reveal the state of our heart – whether it is evil or good. Take notice what Jesus is admonishing His listeners to do in the first verse of this passage – verse 33. He admonishes them to not be hypocrites! He’s telling them to either make the tree good and its fruit good or else make the tree bad and its fruit bad. He’s telling them not to let bad fruit come out of your life, if you claim to be a “good tree”. He’s telling them to let everything that comes out of their mouths to be “good things”. All throughout His ministry Jesus reserved the harshest words for the hypocrites (not that He didn’t have harsh words for just regular ‘ole sinners). And Jesus will also judge hypocrites the harshest, on Judgment Day. As the old saying goes, “you become who you hang around.” People will have influence on you, whether for the good or for the bad. If people are influencing you in a bad way, then you need to stop deceiving yourself. You need to wake up and stop sinning. You need to pluck out the eye, cut off the foot and cut off the hand. You need to do whatever it takes to get the sin out of your life before it ends up costing you your soul. Remember, you will be justified or condemned by your words, even the “idle ones”! Of course, I’m not saying that we can’t rebuke sinners or even rebuke sinners harshly. In fact, in rebuking sinners harshly at times, we are following in the footsteps of Jesus and the Apostles. YET, Jesus and the Apostles didn’t use vulgar language. They didn’t talk about obscenities or sexually explicit things. They didn’t use curse/cuss words in order to get their point across. They didn’t need to and either do we. The Word of God is powerful enough to convict sinners and bring them to repentance! In Ephesians 4, we see an admonition from the Holy Spirit, through Paul, on what the Christian’s speech is supposed to be like. The Greek word that is translated as “corrupt” is σαπρός which means, “of such poor quality as to be of little or no value” and “bad or unwholesome to the extent of being harmful”. The Greek word that is translated as “evil speaking” is βλασφημία (where we get our English word “blasphemy” from) which means, “speech that denigrates or defames”. SO, if any speech or words that you use are “poor quality to be of little or no value”, are “bad or unwholesome to the extent of being harmful” or that “denigrates or defames,” you shouldn’t be using it. 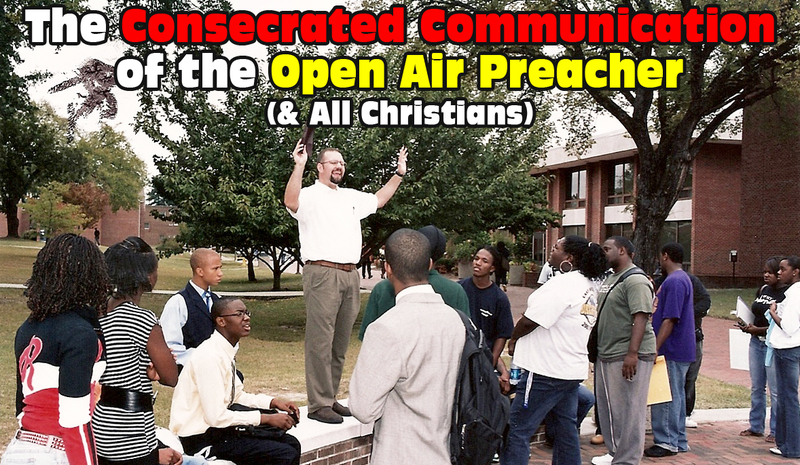 Open air preachers and Christians should have PURE speech when they speak. We should have pure speech when speaking to each other AND when speaking to the lost. God is listening and “keeping a record.” We should only speak what is necessary for edification. We should only speak with the intention of imparting grace to the hearers. We should put ALL evil speaking away, from among us. There’s no reason to dirty up our speech, at least no good reason! Not only did Jesus and the Apostles not do it, but the prophets didn’t do it, John the Baptist didn’t do it, the disciples of the Apostles didn’t do it and the great men of God through the ages didn’t do it. The Word of God is effective enough and cuts deep enough to rebuke the sinner and bring him to repentance. The Word of God is good enough to draw “large crowds” of people to hear the Gospel. And if you don’t get “large crowds”, then who cares! A “large crowd” is not the end goal, by which we can use any means necessary to bring to pass. 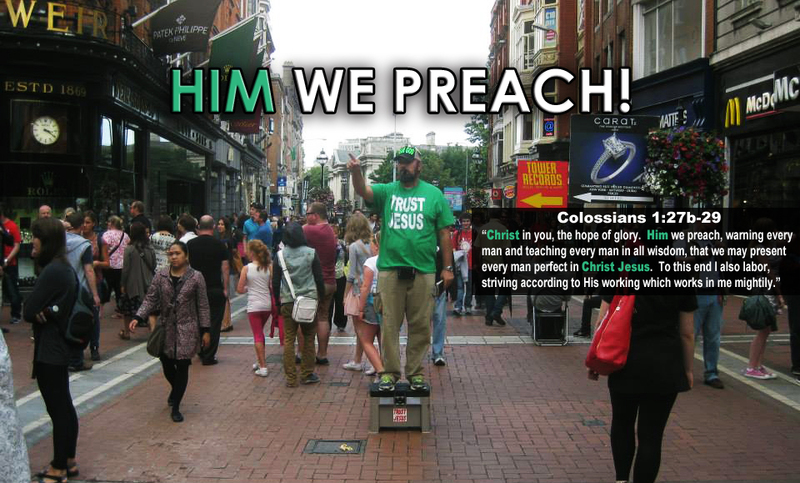 The end goal is to glorify God by preaching the Gospel to as many people as possible. And disobeying God’s Word in our speech is NOT “glorifying to Him” in any way. If we keep the glory of God at the forefront of our minds when we preach, we won’t go off into all of this nonsense. It is when OTHER things come into focus and become the primary goal, that we can get “off track”. It is when we take up the “means are justified by the end” philosophy, that our speech can go “down the drain.” If you are using such speech, do you really think that God is glorified in it? As Christians and open air preachers, we shouldn’t be engaging in “coarse jesting” or “vulgar speech”. We shouldn’t talk about things that are indecent and risqué. We shouldn’t be talking about things that are improper or sexually suggestive. Such things should NOT EVEN BE NAMED AMONG US, let alone be true of us. Such things are not fitting for the Saints of God. They are to be expected from the potty mouths of sinners, who have sewer hearts…but not from Christians, let alone those who represent Christ in the open air. I looked up “obscene” in the dictionary and this is what I found: “of the portrayal or description of sexual matters offensive or disgusting by accepted standards of morality and decency.” Here are some synonyms of “obscene”: pornographic, smutty and lewd. I looked up “ribald” in the dictionary and this is what I found: “referring to sexual matters in an amusingly rude or irreverent way.” Here are some synonyms of “ribald”: lewd, racy, off-color, base, indecent, raunchy, licentious. Christians and open air preachers shouldn’t be using “filthy language” or speech of a kind that is generally considered to be poor taste. We shouldn’t allow “obscene speech” or “dirty talk” come out of our mouths. We shouldn’t speak about things that are indecent, lewd or sexually explicit. We shouldn’t speak about sexual matters in an irreverent way. ALL of these types of things should be PUT OFF. Please examine yourself to see if this might be you. I pray that this helps you in some way and edifies you. If any of this applies to you, then please repent. Don’t keep doing these things, just to “be a part of the gang,” to “fit in” or so that you won’t cause separation between yourself and those who refuse to stop doing these things. God is going to call all of us to give an account of our lives, especially those of us who represent Christ before sinners on a regular basis. AMEN. This entry was posted in Christian Living, evangelism, Gospel, open air preaching and tagged 10 Pitfalls, communication, consecrated, cursing preacher, cussing preacher, evangelism, holiness, holy, kerrigan skelly, obedience, open air preaching, PinPoint Evangelism, pure, purity, sanctified, set apart, speech, street preaching by Kerrigan Skelly. Bookmark the permalink. Love your writing, it is the truth. Have one question though. What perversion of the bible are you using? And 1 Corinthians 15:34 (part’l verse used). The rest of the verse is important. Thanks, Kerrigan Skelly, for getting back. very edified. AMEN. Thank you. This has also been a topic of study for me recently! Amen! Glad you were edified, brother! I have heard open air preachers allude to old testament prophecies regarding the whoredoms of Israel and Judah, to justify using crude and explicit sexual descriptions and stories.How would you respond to that justification? To be honest some of these “parables,” do more to cause me temptation than to make me appalled at the specific sin. Yes, that is part of the problem…these types of stories/”parables” probably cause many people to stumble. I seriously doubt that they ever cause conviction of sin. You can just look at the sinners while they listen to know this. They aren’t convicted, they are enjoying it and drinking it up. I’ve looked at these instances in the Old Testament, with the Prophets and they are NOTHING like what I have heard from some modern day open air preachers. So, there is no justification for it. I would encourage you to look at the specific texts that they use to justify their filthy talk and compare it to what they are saying…side by side. You will see what I am saying. Surely, the tongue is included in this subjection, which brother Paul shows us to practice! Praise the Lord! I agree. Good to hear from you, brother! My name is Andrew. I have appreciated your efforts against Calvinism (especially “original sin”). If I email you my number, would a conversation on some Bible topics (such as Calvinism) be possible? Hello Andrew. That’s possible. Are you a Calvinist? No, Sir, I am not. I believe that Calvinism, including the T of TULIP, is unscriptural. What would be he address to which I would email my number? You would really have to engage in ridiculous hermeneutical gymnastics in order to evade the Biblical truths clearly laid out in this article. Anyone who is “above” correction is certainly endangering their eternal future. 1.The KJV uses the word “whore”, etc. If this justification is to hold any water, the objector must use Elizabethan English exclusively in order to avoid the charge of selectivism, which is hypocrisy. 2. The old testament prophets were harsh and used extreme word pictures. If you take a plain reading of the major and minor prophets, no two callings or ministries were alike. Some suffered silently, others had some pretty harsh things to say, but their instructions were directly divine (not didactic or doctrinal) and highly individual. Their messages were directed at specific groups of people (the houses of Israel and Judah for the most part) for a specific purpose, as revealed to them by God in a supernatural manner, and were confined to a specific time frame. By contrast, the commission to all New Covenant believers to preach the Gospel comes with a completely different set of parameters and instructions, both doctrinal and practical. They are set forth in the teaching and actions of Christ and the Apostles. This is the proper source for all followers of Jesus on how to bear testimony and make disciples for Him.